Straight from Australia comes the Sand & Sky Perfect Skin Bundle, which contains their two core products: the Australian Pink Clay Flash Perfection Exfoliation Treatment and the Porefining Face Mask. Using these two products on your skin will help make your skin look practically perfect to show off for selfies. I saw these products on Instagram and placed an order. I must say I was very happy with the results. Both of these products are vegan, PETA approved and cruelty-free. They also do not contain any nasty ingredients. 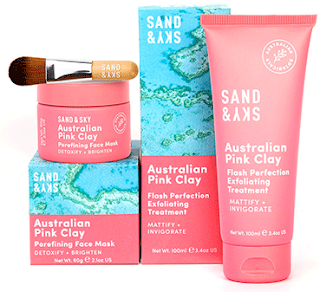 The Australian Pink Clay Flash Perfect Exfoliation Treatment detoxifies the skin with Australian Pink Clay, which is a powerful magnet, to remove toxins, pollution and impurities from deep within the skin. It is the BFF of spot prone complexions, eliminating annoying shine and helping to regulate oil production. Physical and chemical exfoliants team up to smooth and resurface the skin. Bamboo and macadamia seed physically remove any dry, dull skin cells for instant softness. At the same time powerful AHAs from Australian Finger Limes speed up cell turnover for a fresh and beautiful glow. Rich in antioxidant, rosehip, grapeseed and olive oils, it nourishes the skin and restores long-lost radiance. Meanwhile nature's incredible toner, witch hazel, tightens pores and perks up tired skin without stripping it of precious moisture. It can be used as a spot treatment to get rid of pesky dry patches by leaving on for a couple of hours before removing. By applying your regular serum right after using it will increase the absorption of the treatment. To have a little zen moment before applying, squeeze some of the treatment into your hand and inhale. The grapefruit and lime will awaken your senses and boost your mood. Directions for use: Apply to moist cleansed skin and massage for 30 seconds. Avoiding the eye area. Leave it sit for 5 minutes before rinsing off with warm water. For sensitive skin, smooth over the surface of the skin without scrubbing, and let it sit for 5 mins. The Porefining Face Mask is also a magnet for toxins, because of the Australian Pink Clay. It deeply cleanses the skin, purifies and tightens pores right before your eyes. Organic Liquorice stimulates new cell production, while Old Man's Weed tackles pigmentation clusters. Say hello to a healthy, even complexion. Naturally astringent Aloe Vera tightens pores and soothes irritations. Pomegranate boosts collagen production for plump, juicy skin. Kakadu plum and mangosteen work together creating a defense shield to leave skin clear, glowing and selfie-ready. Use before bed time and apply your usual serum and night cream to rejuvenate the skin overnight. It can also b used as a spot treatment by dabbing a little bit on the spot and leaving overnight. Use consistently as part of your regular skincare routine, but not on the same day as the Exfoliating Treatment. Directions for use: Use the applicator brush provided to apply to freshly cleansed skin. Let it sit for 10 minutes until it is dry. Wash off with warm water or a wet towel and pat dry. Use up to 2 times per week if you have sensitive or dry skin, and 2-3 times weekly if you have oily to combination skin. I like both the exfoliant and the mask. The exfoliant works really well at getting rid of detoxifying the skin, dead skin cells, clearing up pores and brightening the skin. The mask also does a good job of detoxifying the skin, purifying it, tightening pores and and lightening pigmentation. However, I don't like the brush that they included in the box. It is small and hard to use. the mask seems to ball up or dry up when used with it. Both of these products are made with natural ingredients and are good products that help clear up blemishes, dead skin cells, pores and brighten the skin. They are available to purchase alone or together. I purchased them together. The exfoliant on its own is $42.90. The mask on its own is $49.00. That is why it is better to purchase them together for the total price of $77.90. You save $14.00!!!! The Perfect Skin Bundle can be purchased on www.sandandsky.com. Like Sand & Sky on Facebook: https://www.facebook.com/SandAndSkyAUS/; Follow Sand & Sky on Pinterest: https://www.pinterest.com.au/sandandskyaus/; Follow Sand & Sky on Instagram: https://www.instagram.com/sandandskyaus/; Subscribe to Sand & Sky on YouTube: https://www.youtube.com/sandandsky and Add Sand & Sky to Snapchat: https://www.snapchat.com/add/sandandskyaus.